What would you think happens to the junk or damaged windshields from all of the vehicles in the U.S.? A lot of it is recycled and given new life as tiles, flooring, landscaping materials, porcelain and counter tops through various recycling and re-manufacturing companies. It’s even traded overseas in Asia and Indonesia in the secondary commodity exchanges and later recyled into art glass beads and jewelry. And now it’s being reused in building construction material in many different forms here in the good ol’ U.S.of A.. But that’s not really anything that’s newsworthy. 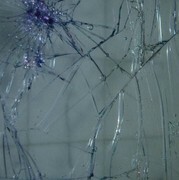 What is newsworthy is the taking not just glass, but car windshields and giving them new life in great new products. There’s a company called SecondGlass that is taking these recycled windshields and making just about anything that you would normally use in any glass application in home and office construction. Things like shower doors and enclosures, artistic room dividers, windows, textured windows and office walls…and more. One of the primary goals of SecondGlass is to seriously reduce the carbon footprint with the products they produce by reducing the amount of landfill space windshields occupy. Secondly, recycling of damaged or junk windshields releases zero CO2 during their unique process of creating useful building products. SecondGlass ascribes to the LEED Green Building Rating System. This is testament to their commitment to the environment to reduce, reuse and recycle. This is, indeed, a patent-pending process combining art with science to achieve a high quality product. They will also add color to the product to fit the application surroundings for a custom look and feel. Take a look at the SecondGlass remanufactured windshield products slideshow to get a better idea of all of the great products that they offer. Windshield glass is basically a “sandwich” of materials…two layers of glass with a plastic liner bonded in-between the glass. How then, is it recycled? First, you must strip it to get the glass and nothing else. This windshield stripper invention does the job nicely. Then you can use the glass for any number of building product applications.